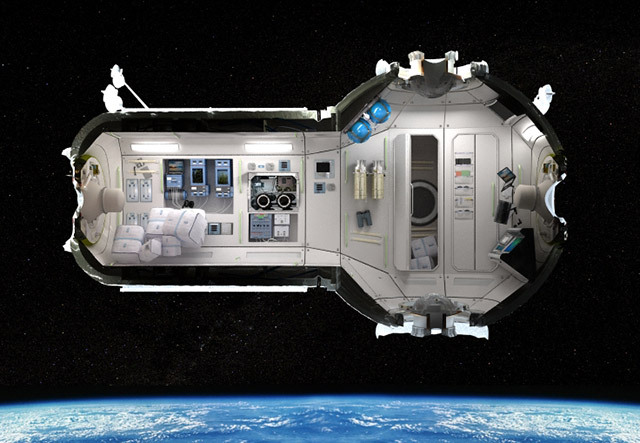 Five years from now you could be one of the first off-world adventurers / Space tourist / traveller to stay for five days in this orbiting hotel built by Russian company Orbital Technologies. Russia and the U.S. agreed in 2009 on a $51 million price for each Soyuz round trip. However prices bound to be much cheaper since there will be many private space ventures in operation during the next decade or two (so far 9 private sector companies are ready to take off into space), creating a competitive environment for such spectacular vacations that could bring the price down to mere stratospheric levels. How will a space tourist get there ? Via a Russian Soyuz rocket, taking you about a day to reach the Commercial Space Station 217 miles above the earth. An unparalleled adventure, residing in four cabins aboard the space station. The best feature of the Commercial Space Station will be its large portholes, which will probably occupy most of your time as you gaze out into the cosmos and down at the earth below.